Collectors are realizing that today's 1953 Franklin half dollar value of $5.60 is just the least of what they are worth. A careful examination of your coin for three important elements is needed to determine its highest value. Mintmarks, these identify the mint that produced your coin. Condition, high grade, nice condition coins are in demand. In the case of the "S" mint 1953 half dollars, boldness of strike. Of the three listed above, boldness of strike, is the one not widely understood outside the coin collecting community. It represents a subtle difference in how well the design was rendered onto the coin and is becoming very important to value. An interesting situation today brought about because the San Francisco mint had a difficult time striking coins in 1953 with fully brought up details. 1953 half dollars are one of those special coins whose value, notably in higher condition, is slightly complex to resolve. Each of the three key factors affecting 1953 Franklin half dollar value is explored in depth below. Again the leader in 1953 Franklin half dollar value is the "S" mint marked examples. Used to identify their production the San Francisco and Denver mints placed mintmarks on the reverse of half dollars in 1953. The main mint in Philadelphia continued with its practice of not using a mintmark. On the reverse examine just above the beam suspending the Liberty bell for either a small "S" for San Francisco or a "D" indicating the Denver mint. 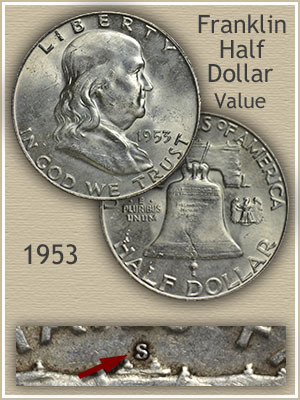 Of all the Franklin halves within the series; 35 date and mintmark combinations, the 1953-S issue is now known as the hardest to find with a bold, complete strike. Collectors while pursuing their quest to obtain the finest, run into a steep challenge finding a well-defined, crisp example of a 1953-S Franklin half. The images illustrate the distinct difference of the common typically weak strike verses the very rare bold strike. Compare closely the lower rim of the Liberty bell; notice the incomplete rendering of the lines on the top image. Virtually every San Francisco 1953 half dollar displays this weakness. Remarkably a small number of completely struck with bold detail 1953-S halves do exist. In uncirculated condition with few marks and abrasions (the gem category) they are in such demand their value is in the thousands of dollars. Your 1953-S Franklin may not be uncirculated nor approaching the gem condition value. However if lightly worn and exhibiting the type of detail in the lower image it is certainly a full strike rarity. In today's market though; no "bold strike premium" is paid for these lightly circulated coins. That said; it is a coin I would have a tendency to keep, knowing its special quality. Note that most of the San Francisco halves this year are rather softly struck; their appearance has an - out of focus - look. Additionally, fine details along the rim of the bell are often missing. 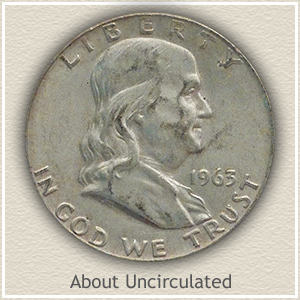 Uncirculated: Mint luster is the indicator of the "uncirculated" grade. A radiating shine; it is the surface condition of a coin when first minted. This luster, the result of metal flow during the striking process, is delicate and the first to wear as a coin circulates. 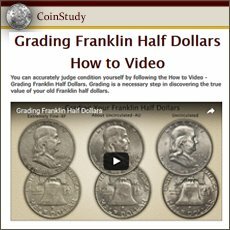 Good indicators to confirm the uncirculated grade is to examine Franklin's cheeks and the field just in front as you rotate the coin under a light. A true uncirculated coin remains brilliant not showing any dulling of the surfaces. 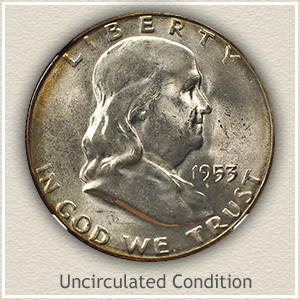 About Uncirculated: Slight traces of wear to the surface is a coin in "about uncirculated" condition. Your coin still has some of the original luster remaining mostly within the lettering. However there is dullness to the high points of the design, first to appear on Franklin's hair just behind the ear. A small amount of color change to the metal is also apparent running down the center of the Liberty bell on the reverse. Tilt the coin to a light to bring out these subtle changes in metal texture. 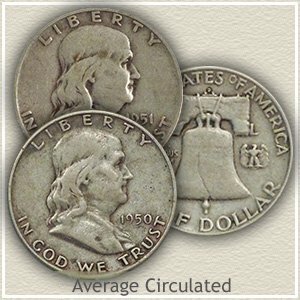 Average Circulated: There is no added value placed on 1953 Franklin halves in less than about uncirculated condition. Once it has worn below this point they are referred to as "average circulated" and all are valued as bullion silver, currently each is worth $5.60 as of 4/15/2019 . The distinguishing feature to look for is the lack of any lettering detail within the bell on the reverse. If the Liberty bell is worn smooth your coin is well within the average circulated condition. Return to Coin Values Discovery... find 1953 Franklin half dollar value and... Coin Values of all US series. Use the image index to identify your coin. Pennies through gold coins all have value charts, mintmark locations described, and importantly grading images to determine condition and find an accurate value of your box of old coins. Value of most Franklin halves ride silver prices up and down. Lately collectors have taken an interest in this neglected series. The result - many dates and mints are collected in circulated grades as well as the traditional uncirculated grades. Check the continually updated values of your Franklin half dollars. Never a week goes by without movement in half dollar value. Silver is the driving force to most of 1953 Franklin half dollar value, however many halves are in the higher collectible range. All series listed with grading images and value charts. Gold per oz. Silver per oz.